A reel mower is a manual-powered mower that relies on your body to make it work. Unlike petrol or electric mowers that do all the work, the way you push it moves the blades to cut the grass. A reel mower is a useful tool for those who have small, postage stamp-style lawns with not a lot of terrain differences. You can pull it out of your tool shed, brush the cobwebs off, and get right to work. A petrol mower, on the other hand, would need you to check the petrol, fluids, and troubleshoot every time you wanted to use it. If the convenience of a reel mower for your small plot of dirt sounds like an excellent option, then read on. Below, we have included information on some of the market’s best, as well as considerations before you add them to your shopping cart. If you only have a postage stamp lawn, then a reel mower such as this one from Sun Joe is all you’re going to need to do the job. While you could go for a petrol mower, who wants to spend all their time maintaining one for such a small lawn? Sun Joe comes to the party with an exceptional mower which could end up becoming your most convenient outdoor product. Not only do you not have to worry about fuel, oil, and lubricants, but you can drag it out of your garden shed and immediately put it to work. It uses five steel blades to cut through the grass and get rid of it quickly. 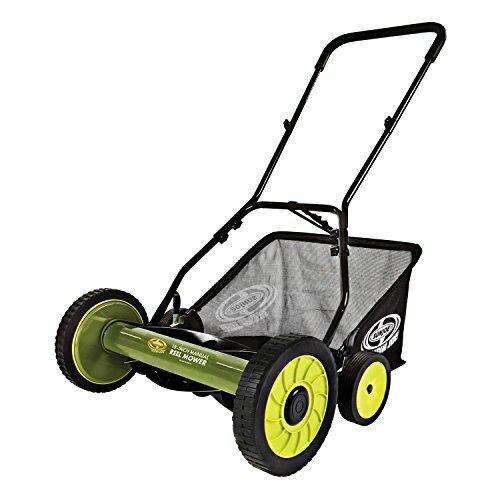 Once it cuts the grass, it pushes it through into the 6.6-gallon grass catcher bag. You may need to empty this quite a lot, but it keeps your lawns tidy. If you need to use your reel mower on a lower or higher setting, then there are choices galore. Nine different height adjustment settings ensure there’s a cutting height to suit what you had in mind. It will then cut a 20-inch path, running smoothly over the yard with two ten-inch and two six-inch all-terrain wheels. Some parts of this reel mower are not going to last all that long because they are plastic, and the handle can be quite weak. However, if you have a small strip of lawn to mow once per week, there are few better options than this mower from Sun Joe. If the costs of running a petrol mower far outweigh the benefits, then it could be time to consider this reel mower from Great States. After all, why would you spend hours maintaining a mower for a small strip of grass? Don’t rely on your neighbors or pay someone to take care of it. Make a small investment in a reel mower and do it yourself. You can choose from four models, all which offer a cutting path of 14, 16, or 18 inches. They are also available in a silver color scheme with an adjustable cutting height, five alloy steel blades, and a T-style handle. The handle is comfortable, cushioned, and grippy. When you’re out mowing your strip of grass, you are going to enjoy how effortless it is. The mower moves with minimal resistance on its ten-inch composite wheels, and it provides an even cut every time. However, it can be quite a slow process to get your entire lawn perfect. It doesn’t cut long grass as well as short grass and can take a few goes to get it right. It also jams with small twigs. Take the mess and hassle out of lawn mowing with this mower from Great States. 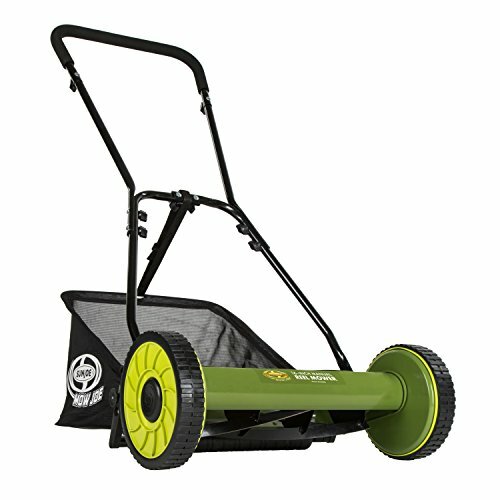 While you wouldn’t use this reel mower from Greenworks on a weed-infested lawn with a lot of mowing work, you would use it on a small postage stamp for occasional mowing. It’s not the best mower on the market, but it’s far from the worst. You can buy it in five models with a grass catcher bag, choosing from a cutting path of 16, 18, and 20 inches. 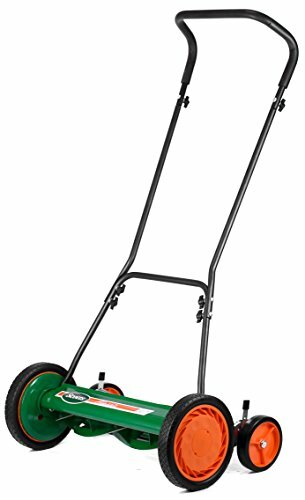 It can cut and mulch your grass, has a comfortable handle, and glides effortlessly over your lawn as it gets to work. If you find the positioning is not quite right, you can move it to one of four positions. You can then get back to work with the help of the ten-inch front wheels and two-inch rear rollers. If you find yourself with long lawns and weeds, you may like to switch back to an electric or petrol mower. This model, while perfect for bowling green-style lawns, cannot handle any challenges. After a few years, it may also start to succumb to wear and tear. It’s affordable, comfortable to use, and offers no end of convenience, but it has severe limitations that could put you off. Many people dream of having a bowling green-style lawn by merely using a reel mower, but sometimes, that’s not enough. A reel mower can take care of all the cutting work, but what about the thatching? Greenworks comes into its own with a corded dethatcher. You can buy this machine with or without an extension cord to power it, and you can immediately get to work. 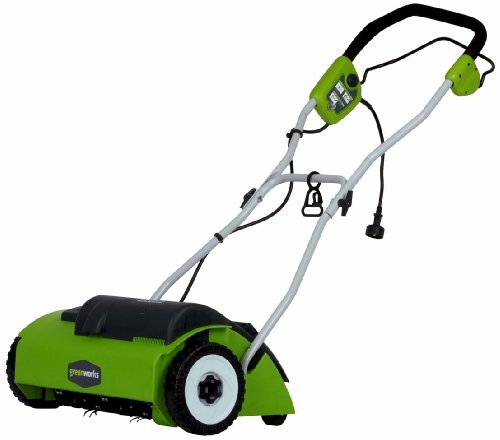 It runs on a ten-amp motor, offers a 14-inch dethatching path, and offers you the option to adjust the tine position to one of three. That’s not all you will enjoy either. The stainless-steel tines do an excellent job at dethatching the most challenging of lawns. As you walk up and down your lawn, you will enjoy how relaxing the experience is. Unlike its gas-powered counterpart, you don’t have to fight with this unit to get the job done. It also has an adjustable, padded, and grippy handle that will provide no end of convenience. The most labor-intensive part of using this dethatcher is cleaning up the thatch afterward. Using the product itself is a cinch. You will be happy you made the purchase. If your lawn mowing requirements are minimal, and you’re tired of fighting with a gas mower, then could it be time to try out a reel mower and see what all the fuss is about? This model from Great States could offer a new perspective on what can typically be an arduous task. Don’t spend hours maintaining a petrol mower when you can haul this lightweight model out of your garden shed and put it right to work. 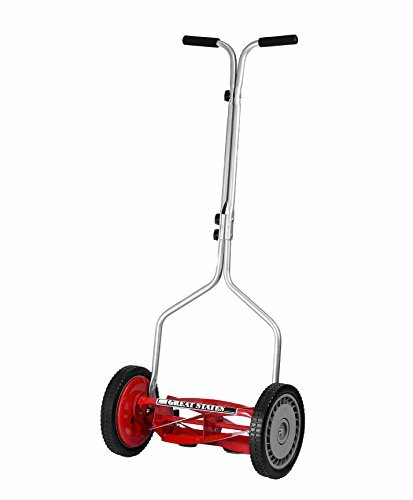 Choose from four models then immediately enjoy how it glides across your lawn courtesy of its ten-inch composite wheels. It has a loop-style handle for comfort and momentum, a black and silver color scheme for style, and you can adjust the cutting height for that bowling green-style look. Even the blades are something special, featuring heat-treated alloy steel to last the distance. This reel mower is maintenance-free, affordable, and takes minimal effort to push. However, it’s only suitable for small, straightforward lawns. You would not use it for tackling long grass or gardens with twigs and weeds throughout. Get to work and put in minimum effort to get the best looking lawns on the street. Many people tire of the maintenance a gas mower requires, but don’t know how capable a reel mower will be. If you have a small, easy-to-manage lawn, then this reel mower from Scotts Outdoor Power Equipment might be the model for which you’ve been waiting. You can choose from the classic or ultra-cut model and an 18 or 20-inch cutting path so you can get the most out of your reel mower. Once you start using it, there’s every possibility you’ll wonder why you didn’t buy one sooner. It has high-quality steel blades, robust ten-inch dual track wheels, and an adjustable cutting height so you can do an excellent job. Even its color scheme is something special, standing out from the crowd in green and orange. 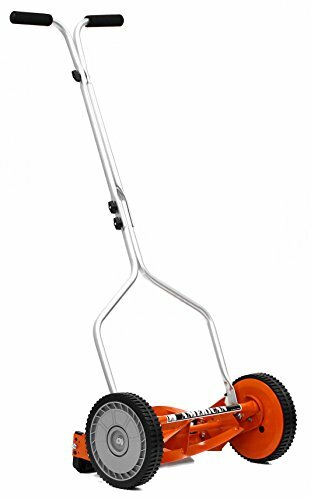 This classic-style reel mower will cut grass quickly, glides cross your lawn smoothly, and has robust wheels which handle moving through your lawn well. It does have a couple of drawbacks though. The cutting bar can work itself loose if you don’t check it, and the wheels can fall off. Perform light maintenance and get this reel mower back to work. If you’re tired of debris making your yard look untidy, and your reel mower won’t tackle some of it, then why not invest in a lawn sweeper? This model from Scotts can be the difference between a well-kept lawn and one that looks like a tornado has rolled through. Don’t let high winds win the battle of yard tidiness. This lawn sweeper has a 26-inch full width to make it suitable for small yards, offers premium materials such as plastic and steel, and will look at its best thanks to scratch-resistant powder coating and paint. That’s not all you will like about this unit either. You can adjust the height, it has an 80 percent pickup rate, and it comes with a collection bag. However, Scotts hasn’t ironed out all the kinks yet. It won’t pick up a lot of debris that’s wet or heavy like nuts, rocks, and pine cones. It also doesn’t adjust low enough for some lawns and requires multiple passes to do the job. The bag for collection also doesn’t hold a lot, even though some debris comes back out the side. There are a few things that might require some adjustment, but you can still use it for a quick yard tidy-up nonetheless. 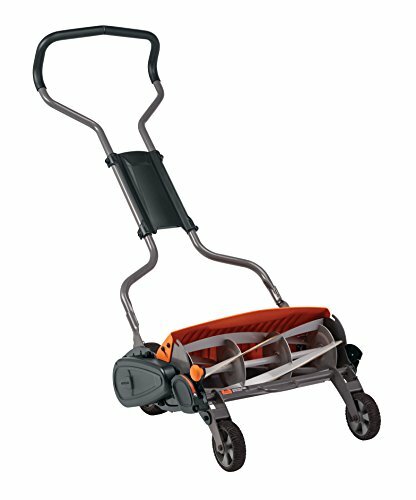 If you use a reel mower that doesn’t run on gas, then why not carry on that theme with a Worx electric lawn edger? While it runs on power, you still don’t need to worry about any fuel. You now have two clean products that both require minimal maintenance. This lawn edger can help tidy up your section when you’ve let it fall into disarray over the colder months. It works quickly and quietly with its 12-amp motor, and you can adjust it to one of three blade depths too. It operates on 120 volts, offers a cutting line indicator for convenience, and the handle pivots for more versatility also. When you use this edger, the comfort will please you too. It’s lightweight, effortless to use, and does the job well. However, Worx needs to make a few adjustments. The guard is too long and digs into the ground. If you cut it shorter, it’s still safe but far more useful for a straight cut edge. However, it’s still an effective and affordable product that will sit nicely together with your reel mower in the garden shed. If a reel mower is no longer suitable for your lawn, but you still don’t want to move over to a fuel-powered mower, then check out this battery-powered model from Greenworks. Even though you have to buy the battery and charger for this unit separately, you won’t mind in the slightest. 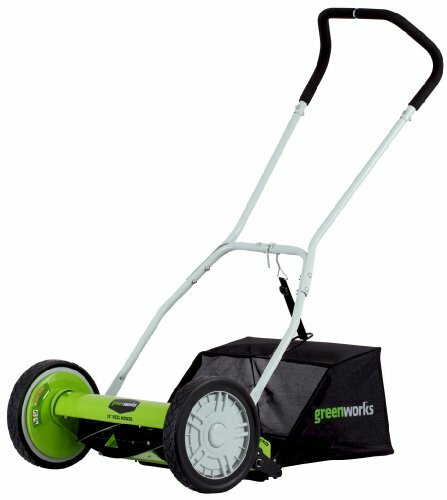 You can also use the battery and charger for most other Greenworks product – thus adding a new layer of convenience. When it comes to cutting your small lawns, this mower covers all basis. You might even say it’s better than your reel mower. One battery charge will see it work for up to an hour, and it uses a brushless mower with Smart-Cut technology to do the job effectively. It also offers a 3-in-1 design that sees it cut, mulch, and put into the bag at the rear. However, you can also discharge the clippings out the side if clearing them up doesn’t bother you. It’s robust and strong thanks to the 21-inch steel deck, and it works quickly and quietly for added convenience. You wouldn’t use this mower on a large patch of grass, but it’s more than suitable for small sections that require minimal care. You would think that more people would be interested in petrol-powered mowers than reel mowers, but reel mowers are making a comeback. If you have a small lawn, they may be something you like to consider. Before you hit the ‘buy now’ button though, take a moment to review the details. You could end up saving yourself a lot of hassles with returns and repairs. No one is ever comfortable when they have to do chores, but out of all mower types, you would expect the reel mower to be more so. It doesn’t take a lot of elbow grease to maintain or keep going. However, some are more comfortable than others. 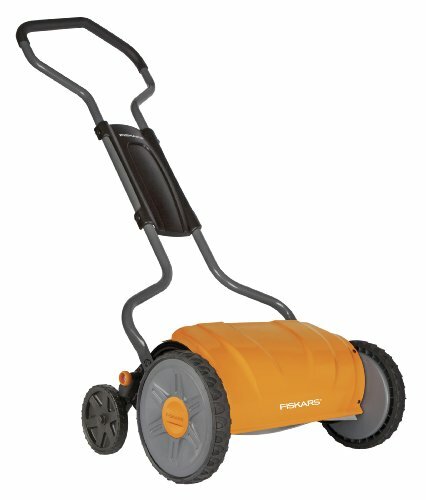 Pay attention to the wheel type, the handles, and how effortlessly it glides over your lawns. To get a grasp on how suitable a particular reel mower will be, read the buyer comments. If you are going to buy a new reel mower, you want it to work. However, not all of them are high-quality or suitable for your task. Take some time to read through the comments and hear about how people rate them. The best reel mower is one that will take care of grass at various lengths. You shouldn’t have to run over the same patch a few times to do the job. The more effort you put into your homework, the more likely you will end up with a reel mower that makes you happy. Believe it or not, some reel motors are better suited to some lawn types than others. Is your lawn usually longer or shorter? Does it have weeds or twigs in it? If your yard can be quite coarse at times, buy the biggest and most robust mower you can find. Otherwise, you will spend a long time trying to get it right. Out of the box, a reel mower isn’t going to be perfect. You may need to do some tinkering and modifications, or even attach parts that don’t come assembled. Find out what you can customize before you buy the mower. The handle and blade height is going to be the most important.